Legendary Hollywood icon and philanthropist Kirk Douglas turned 101 today. Born Issur Danielovitch, December 9, 1916, Kirk is an American actor, producer, director, and author. He is one of the last living people of the film industry’s Golden Age. 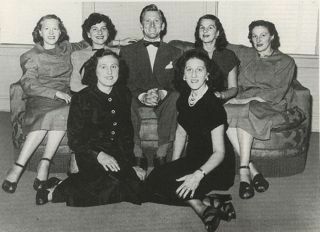 Kirk Douglas with his six sisters, Pesha, Kaleh, Tamara, Rachel and twins Hashka and Shifra. Kirk Douglas (born Issur Danielovitch, December 9, 1916) is an American actor, producer, director, and author. He is one of the last living people of the film industry’s Golden Age. 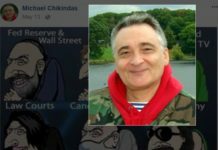 Douglas came from a Russian Jewish family who immigrated to Amsterdam, New York, where he was born. 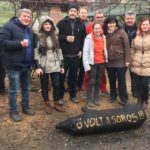 They spoke Yiddish at home. 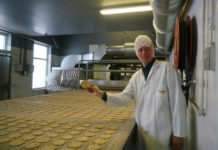 His family was poor, leaving Douglas to support them by performing various odd jobs as he grew up. The grand life of fame that awaited him in the future would have seemed like an impossible dream, though he still pushed on to study at the American Academy of Dramatic Arts, thanks to his good grades that helped him land a scholarship. His time studying at the Academy helped Douglas meet his life-long friend Lauren Bacall, who would prove to be instrumental in helping to kick start his career. Douglas’s debut as an actor came in Broadway in 1941, which he would continue to act in before enlisting in the U.S. Navy during World War II, and before being sent home due to injuries he suffered. Once back, he was advised to change his name, and Kirk Douglas came to be. 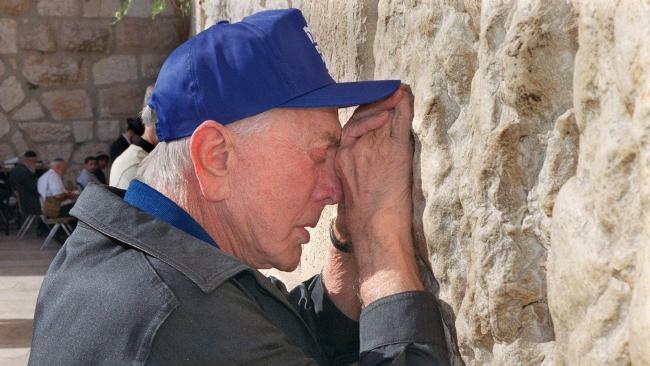 Kirk Douglas prays at Jerusalem’s Western Wall in 2000. Bacall, already quite an accomplished actress, helped Douglas land the lead role in his first movie, 1946’s “The Strange Love of Martha Ivers”, where he starred alongside Barbara Stanwyck, and he would catch his big break in 1949’s “Champion”, where his performance as the ruthless boxer Midge Kelly earned him an Oscar nomination. Crowds were wowed, and Douglas had hit it big. Rising to the top, Douglas would earn two more Academy Award nominations with “The Bad and the Beautiful” in 1952 and 1956’s “Lust for Life”, where he portrayed famous artist Vincent Van Gogh and also won him the New York Critic’s Choice award. Douglas had become so successful that he even founded his own production company, Bryna Productions, which he named after his mother. 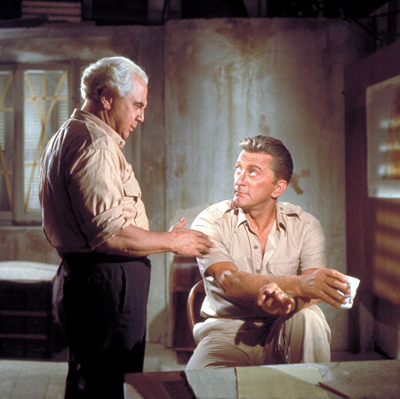 With this studio, the actor would star in his most legendary roles yet, including Stanley Kubrick’s 1960 masterpiece, “Spartacus”, where Douglas’s role as the titular Roman slave who leads an uprising became not only one of his signature performances, but one of the most iconic acting in all of Hollywood. “Spartacus” also challenged Hollywood’s blacklisting of people over suspicion of Communist, as Douglas hired Dalton Trumbo, who went on to have a successful career as a screenwriter. Douglas would eventually try his hand as a writer and director, finding more success with his books than his movies. His 1988 biography “The Ragman’s Son” became a bestseller, and he survived a stroke that still affects his speech, which he would write about in 2003’s “My Stroke of Luck”. Outside of his career, Douglas is also renowned for his immense philanthropy alongside his wife Anne, with acts such as helping to rebuild Los Angeles’s playgrounds; donating over 44 million to charity, feeding the homeless and more. 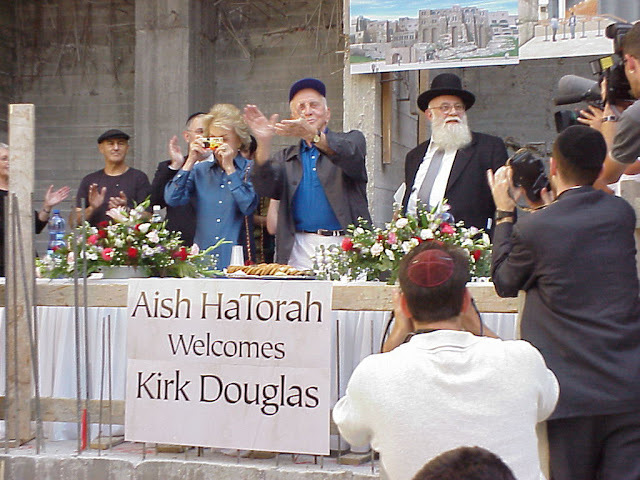 When Kirk realized this is precisely Aish HaTorah’s concept, he made a major commitment to construct a giant-screen theater to Aish Hatorah’s Western Wall Experience. 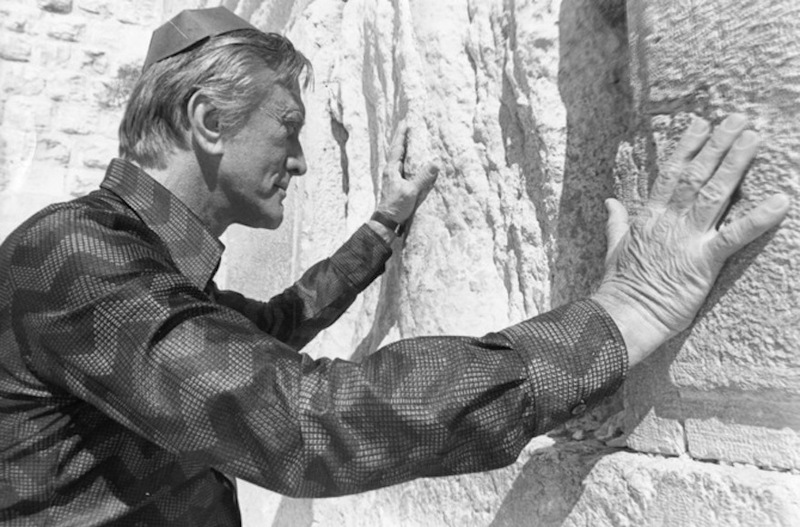 The Experience features the Kirk Douglas Theater, named after Kirk, who was an active student at Aish HaTorah in Los Angeles for many years. 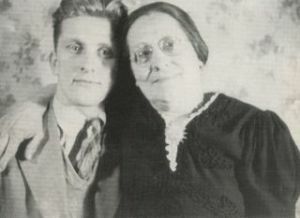 He credits this generous nature back to his mother, who always taught him to help others when possible. In 1988, Douglas was awarded the Presidential Medal of Freedom by President Jimmy Carter, the nation’s highest civilian honor. 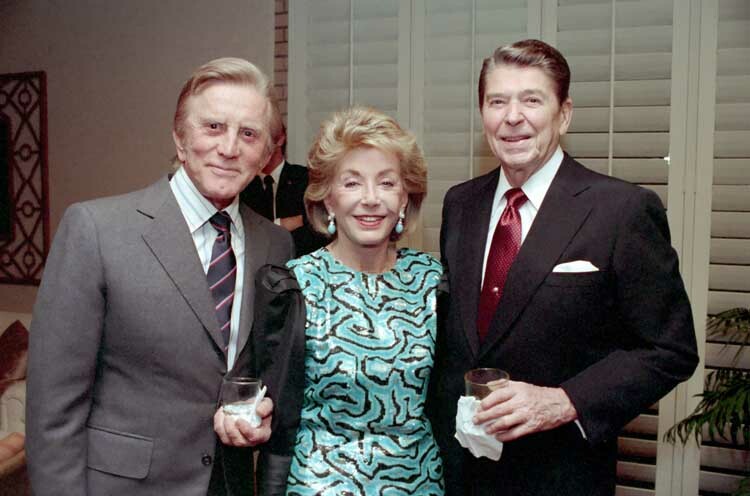 President Reagan with Kirk Douglas and Mrs. Douglas attending a private dinner. 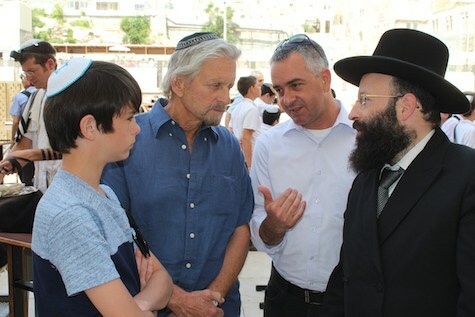 Judaism And I Parted Ways A Long Time Ago, When I Was A Poor Kid Growing Up In Amsterdam, N.Y. Back Then, I Was Pretty Good In Cheder, So The Jews Of Our Community Thought They Would Do A Wonderful Thing And Collect Enough Money To Send Me To A Yeshiva To Become A Rabbi. Holy Moses! That Scared The Hell Out Of Me. I Didn’T Want To Be A Rabbi. I Wanted To Be An Actor. 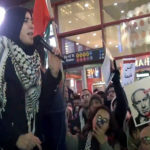 Believe Me, The Members Of The Sons Of Israel Were Persistent. I Had Nightmares – Wearing Long Payos And A Black Hat. I Had To Work Very Hard To Get Out Of It. But It Took Me A Long Time To Learn That You Don’T Have To Be A Rabbi To Be A Jew. 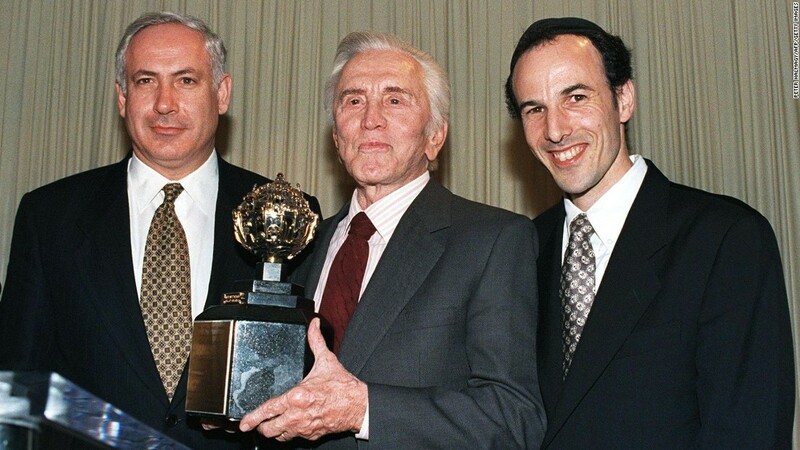 Douglas notes that the underlying theme of some of his films, including The Juggler (1953), Cast a Giant Shadow (1966), and Remembrance of Love (1982), was about “a Jew who doesn’t think of himself as one, and eventually finds his Jewishness.” The Juggler was the first Hollywood feature to be filmed in the newly established state of Israel. 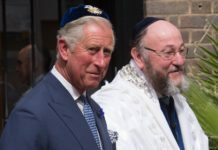 Douglas’ wife, Anne, converted to Judaism before they renewed their wedding vows in 2004.Douglas celebrated a second Bar-Mitzvah ceremony in 1999, aged 83 and a 3rd one at 100. 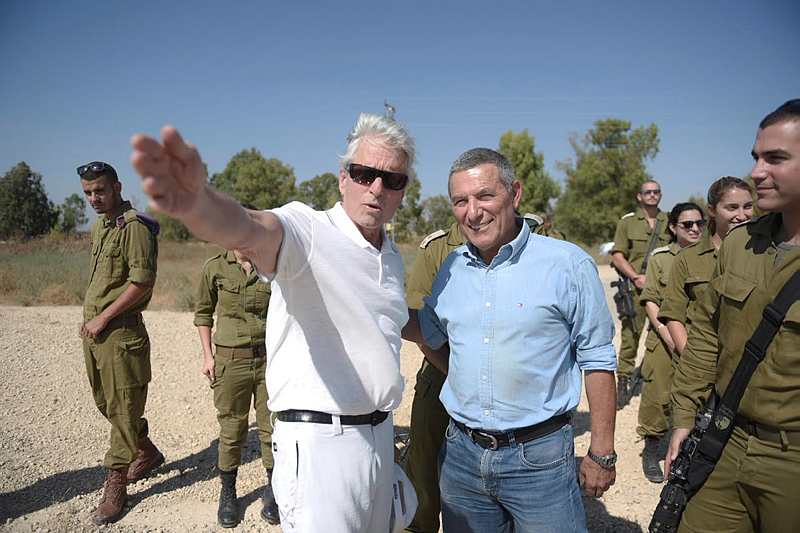 Michael Douglas tours Israel with the IDF. 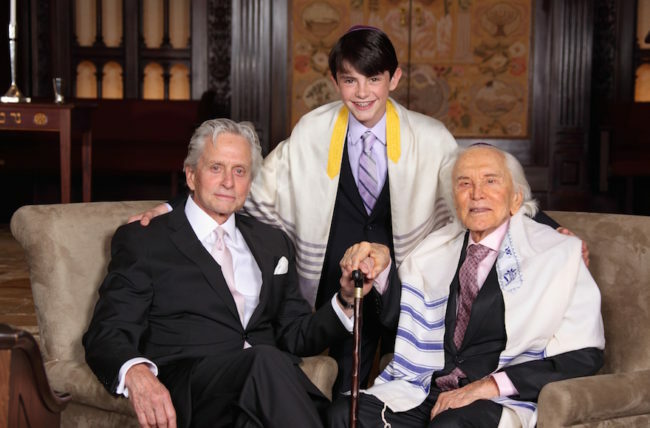 His son, Michael Douglas, carries on the family torch as an accomplished actor of his own right.